Our first design in this most challenging of classes. 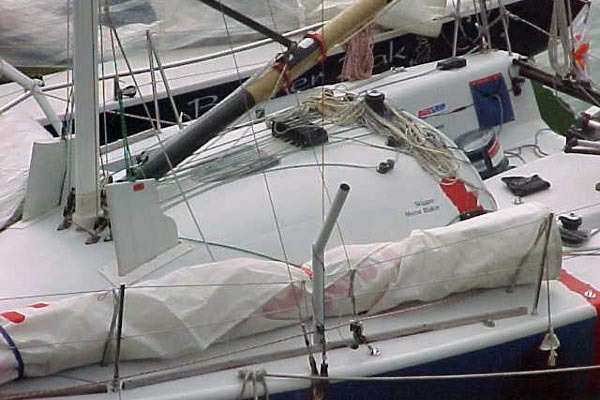 Our 6.5m Classe Mini design for two experienced UK sailors was ahead of the curve when they were launched in 1998. 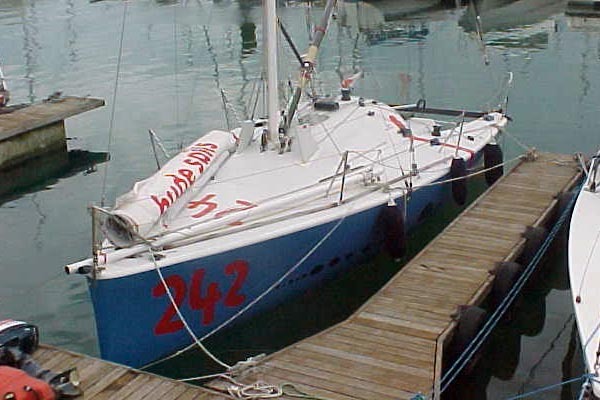 Compared to the then predominant Finot designs numbers 241 and 242 took a number of important steps forward including wider more powerful aft sections and a swept spreader rig further aft for better offwind performance, all of which was reflected in their status as perhaps the quickest Mini’s offwind in a breeze. The main features reflect the development of the modern Proto Mini: the canting keel, twin daggerboards and rudders, 3 spreader swept rig, a compression vang. The excellent deck shape and layout refined by Team 6-5 iwas very successful, while the all-carbon engineering and structural arrangements saw them through a 10 knot collision with a containership and a 360 rollover in the Bay of Biscay without major damage. After the success of the aggressively powerful Team 6-5 Minis in the breezy offwind conditions they were designed for, it became clear that a finer more all-around hullshape would be required to perform in the light upwind conditions which seemed to be predominating, for example in the second leg of the revised Mini Transat course to Brazil. By adding more rocker we could accommodate the larger displacement of a fully laden race-ready Mini better, and that hullform would give us more flexibility in fore-and-aft trim for different conditions.